When a text or a song is very familiar to us there is a temptation to dismiss its content as clichéd, its use, as an expression of ideas or emotions, as hackneyed or sentimentalist. Or at any rate it is a temptation for those of us who have intellectual pretensions; forever on the look out for new, original ideas or previously undiscovered truths. Ordinary folk, on the other hand, at moments of great sorrow or great joy reach out almost instinctively to those texts or songs which have stood the test of time. They make natural companions to such moments because we can perceive if only intuitively that they speak to and from the heart of shared human experiences of the deepest kind. Here we see that the wisdom of the foolish exceeds by far the wisdom of the wise. Psalm 23 can be dismissed as at best one dimensional and at worst a dreary depiction of a patriarchal, hierarchical religion. Yet if we come to it as new, discounting its familiarity, we can see within it the most profound of themes, the answers to questions that we did not realise we were asking. This certainly applies to the two lines which we are considering here. He leads me. The late Christopher Hitchens, God rest his soul, had great fun with the notion of Christians as sheep. He, himself trenchantly resisted the notion of being such a thing himself. Rather ironically many other New Atheists in a thoroughly ovine way have followed where he led and use the term sheeple as an abusive term for believers. What they miss by looking at the sheep is the Shepherd in the same way that the idiot who looks at the pointing finger of the sage misses the moon. Christians begin by looking outward, towards the Christ. When we have seen Him, when we have recognised Him, when we have begun to know Him as He knows us who would not be His follower? We only recognise our littleness when once we have recognised His greatness. The Shepherd leads us first of all to Himself. Those who despise sheeple do not inform the surgeon that they will perform open heart surgery on themselves or the pilot that they will navigate the plane across the Atlantic. Where it affects their physical safety they will submit to any amount of authority and leadership. Where it comes to curbing their pride or recognising the limitations of their intellect in matters of the spirit then they will submit to no one or nothing, except indeed to their bodies and their bodily appetites. The choice, as always, is not between freedom and submission but about to what we shall submit. He leads me. King David, to whom the psalm is attributed, was himself a shepherd. What he and his audience would have known without having to think about it was that shepherds lead flocks. Psalm 23 is couched in the terms of an interpersonal relationship but the subtext is that the shepherd is leading not just one but many. There can be too much emphasis on the notion of individual salvation. Jesus formed a community around Him, a community that endured, that became a Church, a community which still exists today. There are only two commands, He says, love God and love your neighbour as yourself. They are related commands. If we do not love our neighbour and desire for her what we desire for ourselves then self-evidently we do not love the God who died precisely to save that neighbour of ours. The Lord leads me but I can only follow if I consent to do so in company. The Lord saves me but I am only saved if I long as much for the salvation of others, and above all of my enemies, as I do for my own. Beside the still waters. Those of us who live in temperate climates where rain is a frequent guest may not appreciate how it was that in the ancient Middle East water was simultaneously a necessity and a luxury. Its absence was always feared, its presence could never be taken for granted. When Jesus says he makes his sun rise on the evil and on the good, and sends rain on the righteous and on the unrighteous (Matthew 5:45) you might think that He is comparing a good thing with a bad thing. Not at all, the shining of the sun and the falling of the rain were both equally important for survival, they were, and are, both blessings. So for David the image of the waters is a potent shorthand way of expressing the presence of life, of abundance, of refreshment. The quenching of thirst is one of the greatest of physical pleasures, the ending of our spiritual dryness one of the greatest of God's gifts to us. Still waters. A traditional image for tranquility and also for meditation is that of a clear, calm, quiet lake or pond. It is a restful image, and one of the promises of God is to give us rest. A sabbath rest still remains for the people of God; for those who enter God’s rest also cease from their labours (Hebrews 4:9-10) This is a rest which we shall enter into fully only in eternity yet even now we can partially experience it. And stillness in the presence of the Lord is one road by which we can enter into it. Ceasing from activity, from discursive thought, leaving aside our anxieties of the day and being still, placing ourselves before God in a patient, thankful waiting is such an experience of rest. The still waters too are a perfect mirror, they faithfully record what is above it. Our stillness is an opportunity to open ourselves to the image of the One who is above us, to become His mirror to reflect Him to Himself and to our neighbours and to carry that image with us wherever we may go. Beside the still waters He restores my soul. The key factor is, of course, the shepherd. He could restore my soul any time He chose and in any place He chose. Yet our attention here is drawn to the combination of His work and the place where this takes place. The material setting plays a role in the spiritual regeneration. This is a fruit of the Incarnation, of God becoming Man. 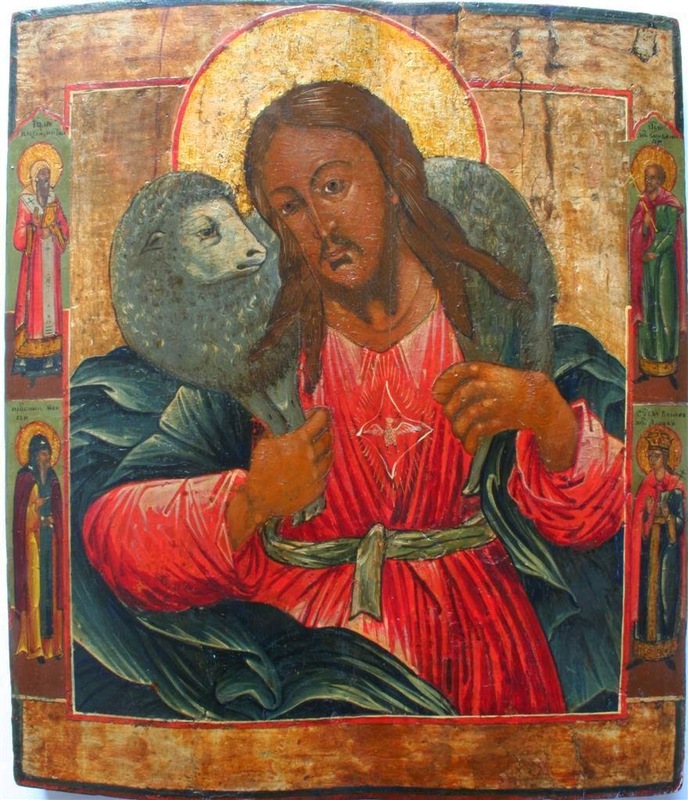 Material objects are not so many barriers to our spiritual awakening but rightly used and in the company of the Good Shepherd they can be so many superhighways precisely towards achieving it. The bread and wine of the Eucharist becomes not only the Body and Blood of God but His Soul and Divinity also and that not despite being material but because His Divine Spirit and His Body are inextricably and eternally linked as One. So, likewise material things, the sound of sacred music, the sight of sacred art, the cool shade of a lakeside arbour can be so many aids or helps to our Lord as He proceeds about the business of restoring our souls. He restores my soul. It is important to grasp this truth- We cannot heal ourselves. We can break ourselves, certainly, but we can't put ourselves back together again. Co-operating in our healing is necessary of course but it is not sufficient. Psalm 23 points us to the healer and gives us images of the healing. Recognising that we are lost is a good beginning to the process of being found. Without Him we cannot come to the waters, we will not find refreshment, our soul will not be restored. Unless we realise that we are thirsty we will not drink. Without Him we cannot know that the answer to our restlessness, our darkness, our pain is to be found in the water that streamed from His spear-pierced side on Calvary. The water that restores my soul is the water of baptism. Restores. Restoration implies a return to a previous condition. When David talks about restoring the soul perhaps he had in mind a return to the pre-lapsarian condition of Adam and Eve, the story of whom is a useful vehicle for summarising Man's loss of innocence and subsequent alienation from God. But we live in a new dispensation now. O Felix Culpa sings the Church, O Happy fault which won for us such a great Redeemer. Our second state is better than our first. If we accept Christ as Lord and Saviour then our condition is infinitely superior to that of our first parents. How much superior we can see above all others in the figure of Mary, the Mother of Jesus. If her Son is the New Adam then she is the New Eve. Jesus is superior to Adam by nature, He is Divine as well as human, Mary is superior to Eve by Grace, she is fully and only human. It is in the nature of things that every creature will have one among their number who is best of all that species and most fulfils the potential inherent in them all. So it is with Mary, she fulfils to the uttermost limits of fulfillment all that humans can be of compassion, love, gentleness and devotion to God and neighbour. She is that mirror which most clearly reflects the Son. She is us as we should be. 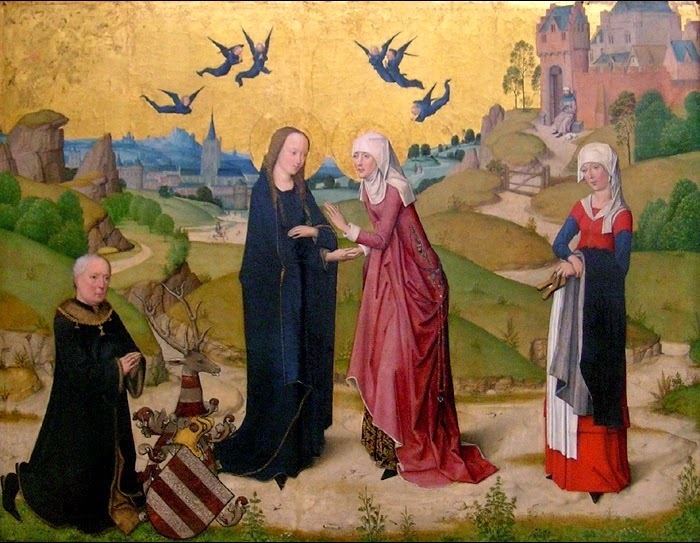 She is the restored soul par excellence because more than restored, O felix culpa, and no one, no one, is closer to Jesus than she. If we would follow Him then we must stay close to her and we cannot go astray. See also @stevhep on Twitter, Google+ and Tumblr. CatholicScotBlog on Facebook and Catholic Scot on Pinterest. I like Psalm 23, and I've always liked it. It's so familiar that actually I think straight past the boringly obvious points one could make about the patriarchy (I mean, you could do that about pretty much most of the Bible). It has a sort of centeringness to it - a sort of 'speak to the hand' when your immediate surroundings try to bend you out of shape - and even if, like me, you don't accept the central tenets of Christianity, I think everyone has the lurking feeling as they are made to be worried about house prices and work deadlines, that probably there's far more interesting things to think, do and be, somewhere else (e.g. sneaking round the Malverns at dusk with Worcester bat group). I would argue that it is an anti-rat-race psalm, and obviously a pro nature psalm. It can be a bit like Abba. Lots of the cool kids from the in-crowd secretly like them would would suffer the torments of the damned rather than admit the fact in public. Of course this example also enables you to date me. The reason why I comment on one bit and not another of the psalm is that in the tradition of lectio divina you pause over the words that speak to you today and hold them in your mind for some time. Occasionally I turn those reflections of mine into blog posts. The line "surely goodness etc" probably has a stronger meaning than the somewhat wistful connotations that 'surely' now carries. David was saying that it was a sure thing that goodness etc. because the Lord would always be his shepherd. I think this depends on the confidence of the cool kid. Every queer cool kid would acknowledge ABBA as canonical, and many stuck with them even through the dark days of rejection in the 1990s. And similarly Christopher Hitchens was not afraid to love Larkin's Church Going. I'm not sure I believe in internet-based cool kids, I think geek chic is the most we can aspire to. An interesting point about 'surely' - completely different tenor, but it's never occurred to me before as a possible reading, let alone the right one. Wh reminds us how ancient texts need to be read with so much care.